Cheap voice-over-internet-protocol (VoIP) phone service helps businesses make and receive calls over the internet for a low price. We looked at a variety of products in the free to $30 range and compared them based on price, features, and customer service to narrow it to the top six and the best overall. The best cheap VoIP phone service is affordable, has easy-to-use features, and is backed by dependable customer support. As the best phone systems for a low price, these solutions should include superior call quality and tools to enhance worker productivity, such as collaboration tools and business app integration. Inexpensive VoIP systems should also effortlessly scale as a company grows and adds more users to their plan. Price: We assessed each provider’s pricing tiers and service plans. Ease of use: Each service was evaluated on how easy it is to set up and use. Call quality: Customer reviews of each provider’s call sound and quality were noted. Scalability: We reviewed the process to add more users to each phone system and how well the cheapest VoIP service plans accommodate company growth in terms of features and pricing. Mobile apps: Smartphone and tablet mobile apps were assessed and compared. CRM and business app integration: We evaluated whether each provider offered integration options for customer relationship and business applications. Auto-attendant: We noted whether the providers offered an auto-attendant as part of its service plans and what features it included. Collaboration tools: Features that allow teams to work more productively and efficiently, such as file sharing and team messaging, were noted. Conference calling: We evaluated any conference calling limitations, such as a cap on the number of meetings or participants. Customer support: Types of online and live customer service support providers offer were compared. Based on our evaluation, we recommend OnSIP as the best overall low-cost VoIP service. It offers a free web-based plan for up to 100 users with unlimited web voice and video calling, as well as per-minute and unlimited calling paid plans. Visit OnSIP’s website for a 30-day free trial. OnSIP is our pick for best overall cheap VoIP service for small businesses. The service is free to use to place calls within your organization or to other SIP phones, or you can upgrade to a paid plan starting at $49.95 per month. Paid plans support unlimited extensions and include voicemail and app integration as well as the option to add on additional features. This makes OnSIP best for companies on a shoestring budget wanting robust VoIP features. OnSIP offers free in-network calling and to other SIP phones, as well as a fixed Per-Minute plan, costing $49.95 per month for service plus the cost of calling minutes. It also offers an Unlimited calling plan, but at $18.95 per user, per month, this option can be expensive for teams of more than three. OnSIP’s free plan includes unlimited calling to other phones on your company’s network and other SIP phones worldwide over the internet. This tier features lines for 100 users with an unlimited number of extensions as well as integration with Slack and Zendesk. OnSIP’s free package is best for businesses on a limited budget and teams that primarily make calls within the organization. This plan doesn’t include the ability to call non-VoIP phone numbers or come with voicemail boxes. However, voicemail boxes can be purchased for an additional $2.00 each. OnSIP’s free plan also doesn’t feature call recording, as offered by Google Voice and 8×8. Unlike Google Voice’s free VoIP service though, it does include business app integration. OnSIP’s flat-rate Per-Minute monthly plan includes external calling capabilities to and from any domestic phone number for 2.9 cents per minute inbound and 3.9 cents per minute outbound. It also features an unlimited number of phone lines, five voicemail boxes, and call recording for one user. OnSIP’s Per-Minute plan is best for businesses that mainly make in-network calls but want an external calling option. This level doesn’t offer unlimited call recording or come with a free phone like the next level. It also doesn’t include unlimited SMS for business texting like Vonage. At $49.95 per month, this service plan costs more than other VoIP business phone services on the surface, but is still a more economical choice for teams of more than three compared to plans priced based on the number of users. OnSIP’s Unlimited plan starts at $18.95 per user, per month and requires teams of five users pass a credit check. This means that the real cost for a team of three is actually $113.70 per month. However, it includes unlimited access to most OnSIP features, including calling minutes. In addition, it offers unlimited call recording and dial-by-name directories, and a free Polycom phone for each user. Other features, including call parking, enhanced hold music, and ring groups can also be added to this plan for an additional fee. This makes OnSIP’s Unlimited plan a good VoIP calling option for teams that don’t want to worry about metered calling rates or having to pay for features they don’t need. OnSIP’s setup is very easy and includes a step-by-step guide to creating a free account using only an email address to begin making phone calls immediately. Users say the dashboard interface can be a little confusing, but the primary call management tools are easy to find and use. OnSIP lacks SMS for business texting and doesn’t include free conference calling with any of its service plans. Conference calling for one user is available for $19.95 and 10 users for $50.00, but customers that want unlimited conferencing for more users with their cheap VoIP systems should consider Vonage instead. Online reviews reveal customers are pleased with the reliability and quality of the calling provided by OnSIP, as well as the straightforward setup. However, some users are disappointed with the provider’s per-minute pricing structure, and that certain features that are standard with other providers cost extra to add to OnSIP’s service plans. Businesses wanting a cheap VoIP service with the option to customize packages by adding a la carte features should try OnSIP. To sign up for a free account or a free 30-day trial of all features, visit OnSIP’s website today. Google Voice is a free virtual phone number provider that works with any mobile device or landline phone for calls and voicemail. It features call forwarding, call block, and text messaging. This makes Google Voice a good fit for solopreneurs who want a free business phone number to separate their personal calls from their business calls, and need little else. Google Voice provides a free phone number for making and receiving unlimited calls and texts for free through your computer. Almost all calls to the U.S. and Canada are free, while calls to select U.S. locations and international calls start at a competitive one cent per minute. Google Voice offers a small set of features that include voicemail, call blocking, and screening. Users can send and receive SMS messages, add multiple phone numbers to their account for forwarding, define which number their calls should be forwarded to along with call forwarding times, and have voice messages transcribed into readable texts. Google Voice matches your incoming calls and texts with your contact list to tell you who’s calling. Similar to Phone.com’s call screening feature, users can then choose to hear the caller’s name and either answer the call, send it to voicemail, or send it to voicemail and listen in live. Google Voice provides call recording at no additional cost, unlike OnSIP, Grasshopper, and most other VoIP providers. This feature is limited to only incoming calls, but after answering a call, users can record the call and have the recording saved to their account with the click of a button. Unlike Grasshopper and Vonage VoIP providers, Google Voice does not have a standard auto-attendant to greet and route callers to different extensions. However, it does have a screening feature that welcomes the callers and prompts them to say their name before the call rings through to your phone. Google Voice mobile apps are available for iOS and Android platforms and syncs across all your devices. Calls and texts are stored and backed up, so call history is always searchable. Unlike Vonage, it isn’t possible to make video calls or create team group texts with Google Voice. Google Voice features voicemail, listen live to voicemail as callers are recording messages, and voicemail-to-email transcription. Other providers on our list also offer voicemail transcription with their paid plans, and OnSIP includes it as a feature of its free tier. Google Voice’s setup is one of the easiest of any phone system. Log in to your existing Google account or register for a free account, then visit the Google Voice page to choose a number in any area code. Once the account is activated, users can make or receive calls and set up voicemail greetings right away. Google Voice lacks many of the features that come standard with other budget-friendly VoIP systems, such as virtual faxing and conference calling. There is no customer support department for Google Voice, so if you have any issues, you’ll have to rely on Google community forums for help. Business owners who don’t want to do without these features should give Grasshopper or Phone.com a try. Our readers who use Google Voice are generally happy with the service and give it 4 out of 5 stars. Customers are satisfied with the routing features, screening, and voicemail transcription. However, some users experienced difficulties porting a phone number to and from Google Voice. To read more reviews, visit our Google Voice review page. Freelancers, consultants, and solopreneurs wanting the cheapest VoIP service with a virtual phone number to separate business and personal calls should sign up for Google Voice. If you already have a Google account, log in to choose a virtual number provided by Google or to port your mobile phone number. To sign up for a new account, visit Google’s registration page. Grasshopper is a cheap VoIP virtual phone system that provides business phone features on your personal device without any equipment to install. For $29 to $89 per month, it offers unlimited calling, auto-attendant, and voicemail, making it the cheapest VoIP virtual phone service for business owners or remote workers who need a business number with extra functionality for their smartphone or landline. Grasshopper offers three competitively priced service plans: Solo for $29 per month, Partner for $49 per month, and Small Business for $89 per month. All plans offer all of Grasshopper’s phone system features, such as unlimited calling, voicemail, and an auto-attendant. One of Grasshopper’s strengths is that with all plans, you get access to all the features and offerings of the system: custom greetings, voicemail transcriptions, an auto-attendant, and more. Customers can choose a toll-free number, vanity number, or local number when setting up an account, or port their own. Grasshopper gives users complete control over how calls are routed, including the ability to define the time of day for call forwarding. The service also offers caller ID customization so users can customize how their caller ID is displayed to callers, as well as inbound faxing to receive faxes and PDF documents, similar to Vonage. Unfortunately, Grasshopper does not feature call recording. Business owners wanting to record calls for quality assurance, training, and record keeping purposes should turn to Vonage or 8×8 instead. Grasshopper provides an automated attendant that answers all your calls and forwards them to your defined extensions. It’s easy to use, and admins can set up either departments or individual employees as extensions. As with OnSIP, employee names are listed in the dial-by-name directory, allowing callers to reach them by name. The Grasshopper mobile app is where the product truly shines and why Grasshopper is our top recommended softphone provider. The mobile app, which is available for Apple and Android phones, gives users full control of their account through a mobile device. As with Vonage, making and receiving calls, configuring extensions, and SMS messaging can all be performed in a few simple clicks. Voicemail messages left on a Grasshopper VoIP system are sent to users as an audio file in an email message. Similar to 8×8, if the mobile softphone app is installed on a user’s smartphone, they can also retrieve a transcribed copy of the message and easily manage messages without having to dial into a voicemail system. Grasshopper has an easy setup process that allows users to begin using their new number and virtual phone system as soon as the account is registered. The online web portal isn’t overwhelming with too many options, and all the configuration settings are easy to find. Unlike Vonage’s full-service VoIP business phone packages, Grasshopper is a call forwarding system similar to Google Voice. Therefore, it’s missing features like 8×8’s free international calling or OnSIP’s free Polycom phones. Our reader reviews of Grasshopper are mixed. Customers say they enjoy the quick setup process and how simple it is to manage a business line and a personal line on the same device with the mobile app installed. However, some users report troubling issues with customer support and sales agents who don’t always provide reliable information. Read more at our Grasshopper user review page. Businesses owners and solopreneurs looking for the cheapest VoIP service with a virtual business phone number and extra functionality should check out Grasshopper. The company offers a seven-day free trial with no credit card required. Visit Grasshopper’s website for details. 8×8 is a cheap VoIP phone system with a complete set of features that include conference calling, SMS messaging, and call recording. It also offers unlimited international calling plans for up to 47 countries for $25 to $55 per user, per month, making 8×8 the cheapest VoIP service for businesses with international clients, customers, or vendors. 8×8 Virtual Office provides three economical pricing tiers: X2, X5, and X8, which are $25, $35, and $55 per user, per month, respectively. While not the most economical provider on our list, all plans include an auto-attendant, integration with Salesforce, and unlimited calling to up to 47 countries. 8×8’s X2 plan features unlimited calling to 14 countries, audio and video conferencing for up to 100 participants, and call recording. It also offers an auto-attendant, unlimited extensions, a phone number, and mobile apps. This plan is a great option for the cost-conscious business owner who needs to be able to service and reach international clients. This tier doesn’t include the operator switchboard offered with the mid-range package. It also lacks OnSIP’s dial-by-name directory feature. At $28, 8×8’s X2 plan isn’t the cheapest VoIP service entry-level package on our list, but the unlimited international calling to 14 countries may offset the price of less expensive providers that charge by the minute. 8×8’s X3 tier adds unlimited international calling to 32 countries. It also includes an operator switchboard for routing and transferring calls from a computer browser or Polycom desk phone. 8×8’s X5 plan is best for businesses that want a larger international calling radius to contact customers and clients in more global locations. This level is missing the premium tier’s interactive voice response (IVR) system and advanced analytics. 8×8 X3’s $38 price point is on par with Vonage’s highest service plan, but Vonage doesn’t offer free international calling. 8×8’s X5 package includes unlimited international calling to 47 countries. It also adds an IVR system that routes inbound calls based on the caller’s response to voice prompts, as well as advanced reporting to provide data on contact center, service quality, and supervisor analytics. 8×8’s X5 plan is best for larger businesses, sales, and call centers with a high volume of customer calls. This package doesn’t offer a predictive dialer for automating outbound calls, post-call surveys, or customer experience analytics. However, businesses requiring these tools could invest in 8×8’s enterprise level, X6, for $155 per user, per month. At $60, this X5 service plan is the second-most expensive plan on our list behind Grasshopper’s Premium plan. However, this tier offers more features than Grasshopper and unlimited calling to more than 40 countries. 8×8’s setup process is easy and requires no special equipment or hardware. As with many VoIP business phone system providers, the entire system is controlled through an online portal accessible from any web browser, so tasks, like assigning employee phone numbers or setting up the automated attendant, are streamlined and efficient. 8×8’s upper tiers lack the affordability of some of its competitors. However, businesses that make a lot of international calls may prefer an unlimited global calling plan over the per-minute rates offered by VoIP providers like Phone.com. Our reader reviews suggest business owners consider 8×8 to be one of the cheapest VoIP services for making calls to international customers and vendors. However, some customers report generally unreliable service, from phone quality to customer support—something to consider when making purchasing decisions. Check out more reviews on our 8×8 reader review page. Companies needing an inexpensive VoIP phone system to make and receive a lot of international calls and want the predictable billing that comes with unlimited calling plans should give 8×8 a try. Call a solutions specialist at the company’s toll-free number to sign up for an account or request a customized quote through 8×8’s website. Vonage is a cheap VoIP phone service with unlimited calling, auto-attendant, and voicemail. It also features integration with a variety of business and customer relationship management (CRM) platforms. At $19.99 to $39.99 per user, per month, Vonage is right for sales teams and companies wanting a VoIP system that ties into their collaboration and productivity tools. Vonage has three affordable package choices: Mobile, Premium, and Advanced. Pricing runs from $19.99 to $39.99 per user, per month and includes unlimited calling, CRM integration, and mobile apps. Vonage customers can choose additional options from a list of add-on features to customize the phone plan to the unique needs of their business. Vonage Mobile includes unlimited domestic calling and SMS for business texting, and mobile apps to link your business phone number to your mobile device. It also features Team Messaging with group chat, voice, SMS, video calls, file, and media sharing through mobile and desktop apps. Vonage Mobile is a good choice for remote teams and organizations that don’t use desk phones. This level doesn’t include a multi-level auto-attendant, CRM integration, or call group featured in Vonage’s upper levels. Unlike Grasshopper, it also doesn’t include free phone numbers with service plans, but they are available for an additional cost. A local phone number is $9.99 per month and a toll-free number is $39.99 per month. At $19.99 per user, per month, this is one of the cheapest VoIP service plans on our list, but a la carte add-ons could drive up the price. Vonage’s Premium plan adds a multi-level auto-attendant to greet and route callers, and video conferencing for up to 100 people. This tier also includes business app integrations with a number of platforms, including Salesforce, Zoho, G Suite, Office 365, SugarCRM, and NetSuite. Vonage Premium is an excellent fit for sales teams and organizations wanting a low-cost VoIP phone system that works with a range of business apps. This package doesn’t include visual voicemail that’s available with the highest service plan. It also doesn’t include call recording, a feature 8×8 offers with its cheapest VoIP service plan. Vonage Premium is priced about the same as 8×8’s first-level plan but offers more in the way of integrated business apps. Vonage Advanced adds visual voicemail to transcribe messages into text and delivered to your email inbox. It also features on-demand call recording that allows workers to choose when to record calls. Automatic call recording to record all calls is available for an additional $49.99 per month. Vonage Advanced is a good choice for call centers and businesses that want to capture calls for quality assurance and training. While customers can choose to purchase a local or toll-free number to pair with their VoIP phone system, selecting a vanity number isn’t an option like it is with Grasshopper. Vonage Advanced costs less than Grasshopper’s Partner plan but offers significantly more standard features. Vonage is a cloud-based VoIP system and, like other providers on our list, no equipment is required to get started with the service. It has a clean and intuitive user interface, and the mobile softphone apps provide a smooth experience for making and managing calls. Vonage regularly checks the status of network-connected devices to ensure they are working correctly, and automatically route calls to a different device or number if a malfunction occurs. Vonage’s service plans lack some features that come standard with some of the cheapest VoIP services on the market, such as call recording and free local or toll-free phone numbers. Although those features are available for an additional cost, businesses that don’t want to pay extra for them should consider 8×8 or Grasshopper. Our reader reviews praise Vonage for its easy setup and say the interface is pleasant to use. Despite an overall good reputation, some other users were disappointed with the customer service wait times and the inability to cancel services online. For a more comprehensive summary of users’ experience with the provider, read our Vonage user review page. Sales teams and businesses wanting a cheap VoIP phone system that integrates with their existing business productivity and CRM should try Vonage. Calling the company’s sales department or completing the signup form on the website will get you started quickly. Vonage also offers a 14-day free trial, and you can cancel at any time without penalty. Start your free trial today. Phone.com is a cheap VoIP business phone service that provides phone numbers and bundles of minutes. For $12.99 to $39.99 per month, it includes SMS messaging, auto-attendant, and voicemail. Phone.com is best for organizations that don’t make a lot of calls or need the cheapest VoIP service plans with unlimited minutes. Phone.com offers three pay-per-minute plans: Base, Plus, and Pro. Prices range from $12.99 per month to $39.99 per month. All plans include a local or toll-free phone number, monthly minutes, SMS messaging, unlimited user extensions, and an auto-attendant. For the business owner looking for a cheap VoIP system, Phone.com provides a standard set of features that you come to expect from most of the VoIP providers on the market. Conference calling, on-hold music, a dial-by-name directory, faxing capabilities, and a mobile app are among the features Phone.com includes with its cheapest VoIP service plans. Phone.com’s call management tools include call forwarding, call block, and call transfer. You can also create separate incoming call extensions for departments or employees without adding additional phone lines. Like Grasshopper, this is a cost-effective way of having multiple users within your business receive calls on your primary phone number. Phone.com offers system-wide call recording and selective call recording by phone number or extension. All recorded calls are stored in the account’s call logs for 13 months and can be downloaded and saved as MP3 files. Unlike 8×8 or OnSIP, call recording is not part of Phone.com’s service plans and must be purchased as an add-on starting at $4.95 per month for 300 minutes. The automated attendant provides an automated menu that greets your callers and provides basic information about your business, such as hours of operation. The auto-attendant can be customized with your own greetings and on-hold music and, similar to OnSIP, also includes a dial-by-name directory that prompts the callers to search by first or last name for different employee extensions. Phone.com’s mobile app allows users to manage their account without logging into the web interface. Customers can make and receive calls through the desktop app or download the mobile app on an iOS or Android device. Like Nextiva’s mobile app, it includes all the same features as the desktop app. Similar to Nextiva, voice messages received through Phone.com’s system are automatically saved and sent to the recipient as an email message with an audio attachment. For an additional $1.50 per extension, per month, customers can add voicemail transcription-to-text. An added feature most VoIP providers don’t offer is human transcription for 25 cents per voicemail, which transcribes emails by real people instead of an automated system. Phone.com has an impressive self-service platform. Customers can begin using the system as soon as registration is complete. With a few simple clicks, users can route calls and manage other features, or purchase VoIP phone adapters that allow business owners to use their existing analog phones. Phone.com’s flexibility to customize your plan with additional features can either be good or bad, depending on your needs. If you’re looking for a cheap VoIP with a complete set of features, the additional cost for features like voicemail transcription or call recording can raise the price of using the system beyond what your budget might allow. In these situations, comprehensive VoIP systems like OnSIP may be a better fit. According to our reader reviews, Phone.com customers enjoy the ability to reduce their monthly costs by choosing the pay-per-minute plan over the unlimited calling plan. However, some users find the added cost of features to be more of a burden and desire a more complete set of features with the packages. To learn more about what users have to say, check out our Phone.com user review page. Companies that want a cheap VoIP phone system but don’t want to pay for unlimited calling and prefer to pay by the minute should consider Phone.com. Base plans include a 30-day money back guarantee. To learn more or to set up an account, visit Phone.com’s website today. 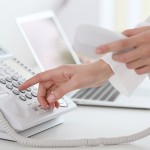 VoIP business phone systems are quickly becoming the gold standard for small business phone communication. With costs much lower than traditional phone systems, several providers offer cheap VoIP systems that aren’t light on features and functionality. Companies wanting the best cheap VoIP phone system with the best combination of features and backed by reliable customer support should give OnSIP a try. The company offers free accounts and a free 30-day trial of all features, so visit OnSIP’s website. Choose from toll-free, vanity & local numbers - FREE Trial!